In the manufacture of packaging for health, beauty and cosmetic products, an elaborate range of materials can be called upon to achieve the right look, from SBS (virgin board) to metallized polyester. High gloss UV coatings are often employed to achieve higher reflectivity. At GCI we will work with you and make sure that we appreciate the specific requirements and goals of your project. The end result will be packaging that meets the correct standards for transportation, storage and display, and provides an optimal surface for your graphics to visually pop and catch the eye of the consumer. We utilize the latest technology to design and manufacture health and beauty packaging and cosmetic packaging for our customers. All of our folding carton products are custom made to perfectly fit our customers' requirements. We aim to develop a partnership with each customer that's based on communication, responsiveness and trust. 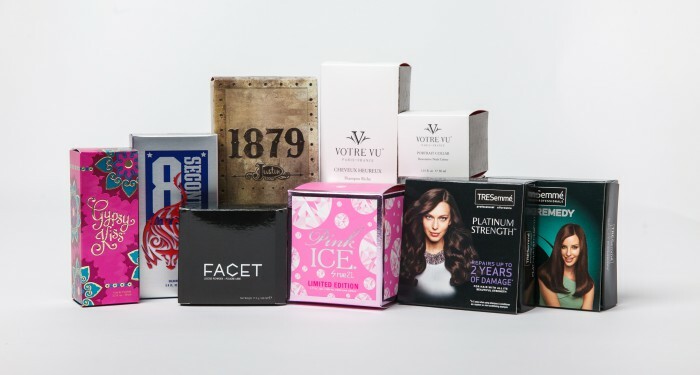 Whether it's a folding carton that will enclose hair care products, perfume bottles, lipstick, lip gloss, or any of an almost limitless range of other health, beauty and cosmetic items, our customers come to us seeking custom specialty packaging that will safely carry the product at the same time as it carries a message of quality, distinction and professionalism. Cosmetics and Fragrance Packaging plays a pivotal role in making a product stand out from the competition and attract the attention of buyers. When you know exactly what you need, we're happy to provide it. If, on the other hand, you're seeking design assistance and advice from people who have cutting edge knowledge and experience in the field, then GCI can give you creative options to choose from. Although we make boxes, we think outside the box when it comes to packaging design. Samples of custom health and beauty or cosmetic packaging can be turned around in two days, and often as promptly as 24 hours.